This is a Cooper Vanguard III mercury vapour fitting outside my house. The pole will do double duty as a clothesline post. The wire is underground fed from my house. What a top job - looks like i has been done by a power company. Well done! Years of observing power company installations + careful selection of materials + careful planning + intallation = this setup ! This scene has slightly changed as now this lamppost doubles as a clothesline post. I will have to take a picture sometimes. Say NO to DICTATORSHIP in the form of bulb/tube/ballast bans !! Is that a 6X6 post? Looks about 10ft tall? Yes, a 6x6 that is 16 feet tall. The foundation is concrete in a 24 inch Sono tube, about 5 feet in the ground and 1 foot above. Quite heavy to lower and raise, worst in winter when the wood is slightly swollen and rubs hard on the iron channels. Intended to be able to be laid down to be relamped, vs. a ladder? Oh, and I can't lower it by myself, I always need someone to help. I, myself, also hate heights, so I don't blame you in either case. I think it's a psychological fear of something letting go. For instance, I hate airplane take-offs, I sometimes have to look away if in a window seat, but once used to it and "knowing I won't fall" I guess, I love watching the scenery passing from, say, on a most recent trip, San Francisco to Seattle from 30,000 feet, flying right over what I presume to be Portland along the way. I think my fear is of the ladder itself, the fact it is not secure and only leaning on the surface at the top end. If the height is reasonable and the top is quite secure, I can get to it. I regularly climb in the bell tower at church, but no ladder is taller than 10 feet or so, and they are permanently attached to the floors above. I also quite like going up tall buildings provided the climbing equipment is very solidly attached (I'm talking stairs, ladders or elevators, not ropes and harnesses). Also, there must be adequate railings or windows where I can enjoy the view. An exemple of this is looking at the Eiffel Tower from the top of the Arc de Triomphe in Paris. As for the step ladder I'm considering, I have already thought of a way of fastening the top of it to the pole before climbing. I also like views from tall buildings, but even those freak me out at times, that I'm going to fall through a window I guess? Though I'm used to ladders that are permanently attached, there were some at a wharf I had to deal with at low tide...20 feet high, bent inward by things hitting them, so safe. NOT. As much as I like street lights, one of the worst jobs I could have chosen would have been linesman. I wouldn't mind the bucket truck, but you still have to learn to climb with a harness as some poles are not accessible by truck and trucks are machines that can fail. I agree with you sol. I can be way up there and have no fear if everything is engineered in place. But stuff that's not "solid" like ladders, ropes, etc. forget about it! However, I am going to school to become a lineman. We'll see how it goes... After a few tries climbing the pole I'll probably just get used to it and move on from the fear. @streetlight98 : With both feet on the ground, I wish you all the best ! Good luck! I just hope you wont mind if for your job you have to deal with wasps or replacing vintage fixtures with crappy new LED stuff. I would maybe have some interest in that job, but I have a big fear of heights and bucket trucks look very unstable to me. I am fine with ladders when they arent that high but anything else is too much for me to deal with. I probably won't get to work with lights very often. Most of the cities here are buying ownership of their lights from the electric company and installing LEDs. I don't imagine there will be very many Company-owned lights left in a few years. What's that metal thing at the base of the pole holding this up? I'm hopefully going to get to install something like this on someone's farm this summer. It would be 12' instead of 16 though because it doesn't need to light up a huge area. Also, how much did this whole setup cost to install? Do you mean the green metal ? That is iron (steel maybe, I don't remember but it rusts) 6" channel, about 4-5 feet length, sunken half way into a 24" Sono tube concrete base, about 5 feet in the ground and 1 foot above. The pole is a 6x6. For the cost, I didn't really calculate. I bought the parts over six months or so. I had an excavator dig the wiring trench and the hole and I had the concrete delivered ready mixed. The excavator was here for other jobs on my property, and I remember paying a small load surcharge for the concrete. The street light was 200-250 dollars, I think. 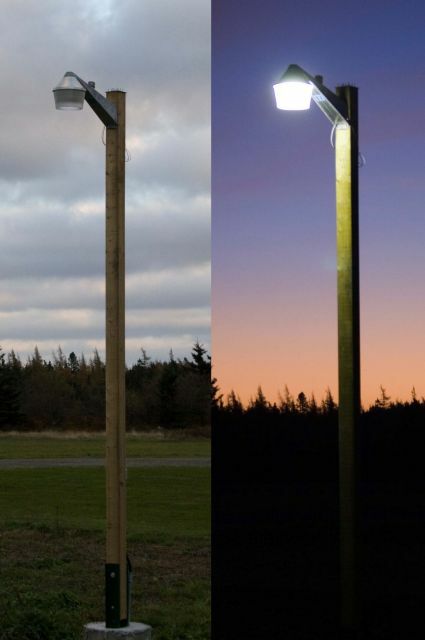 That is the nicest looking wooden post light I've seen ever... Good job on that one! awesome! I really like that dusk picture! May 17, 2018 at 09:57 PM Author: Cole D.
Beautiful pictures and very nice job! Thank you for all of your nice comments. Actually, that is a dawn picture. I took it first, and about one hour later, I took the other one.